Belgian born artist Luc Janssens graduated with a Master of Fine Arts degree from the Royal Academy of Fine Arts in Brussels, Belgium, where he studied drawing, painting and printmaking. Shortly after completing a Master of Arts degree at California State University and a Doctoral degree at the University of San Francisco, he established his permanent residence and studio in California. Dr. Janssens has taught art at Merced College, Merced California where he was chair of the Arts Division. He was a faculty member and chair of the Foreign Language Department at Diablo Valley College, Pleasant Hill, California, visiting professor of art at Qufu Teacher’s University, Qufu, and faculty member at Shandong University, People’s Republic of China. As a printmaker and photographer, he has been involved early with photo techniques in art. His work often combines lyrical drawings and photographic imagery, which create a juxtaposition of fantasy and reality. With his gestural aquatints and soft grounds contrasting against the visual clarity of his photogravure, the artist makes full use of the printmaker’s repertoire. He has also produced, in limited editions and often in collaboration with poets and writers, photogravure portfolios of architectural, travel imagery and portraiture. 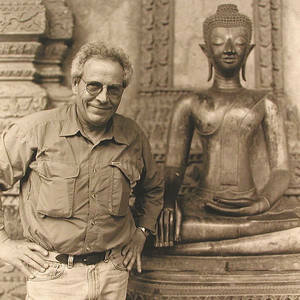 His work is represented in private, institutional and corporate collections in United States, Europe and Asia.